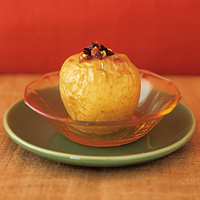 Any good baking apple, such as Golden Delicious, Rome or Granny Smith, holds its shape beautifully for this dish. Serve it as a light dessert, or alongside roasted pork or pork tenderloin. Preheat the oven to 350 F. In a small bowl, toss together the cherries, almonds, wheat germ, brown sugar, cinnamon and nutmeg until all the ingredients are evenly distributed. Set aside. mmmmmm it's not fall without baked apples!